My wife's grandfather, Able seaman Herbert Alfred Quennell survived the sinking of HMS Alcantara in 1916. 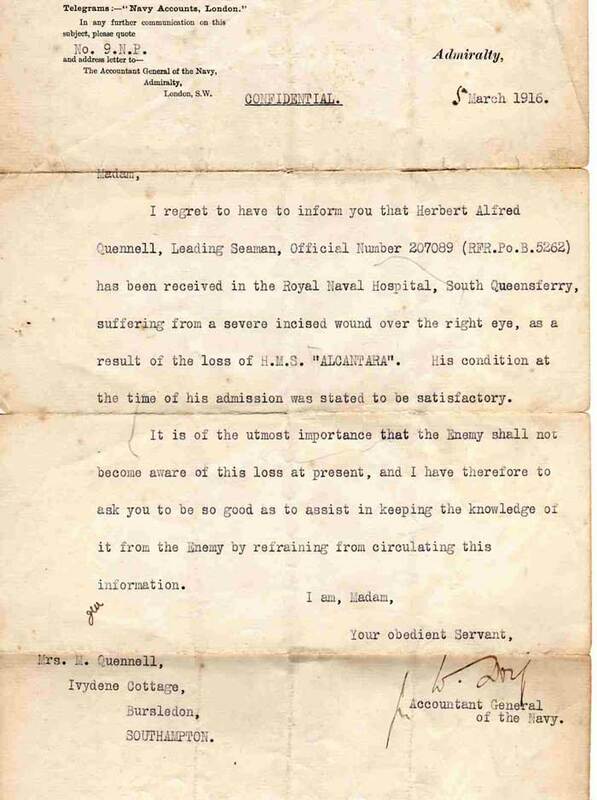 We have in our possession the document referring to his admission to Queensferry hospital, Scotland, with serious head wounds. We also have the document sent to his wife requesting her complete silence as to the sinking. The 1901 UK census reveals that he was an 18 year old sailor serving on HMS Resolution based in Gibraltar. Great site. Thanks a lot. Thank you for your note, the fight between Alcantara and the German Armed Raider Grief, was indeed a slugging match, and your wife's Grandfather AB Herbert Quennell, was most likely lucky to survive that battle especially as he was wounded. Are you able to share the documents you have please? so we might post them on AHOY at my account of this engagement back in 1916. I am sure some of our visitors to that story would be fascinated to read your unique material, especially the stay silent request. In those days it was much easier to throw a " Wall of Silence" around a specific event that the authorities wanted kept quiet, than it is today with all our modern methods of communication. Your kind words about AHOY are much appreciated. Best wishes to you and your family for the forthcoming Festive Season. 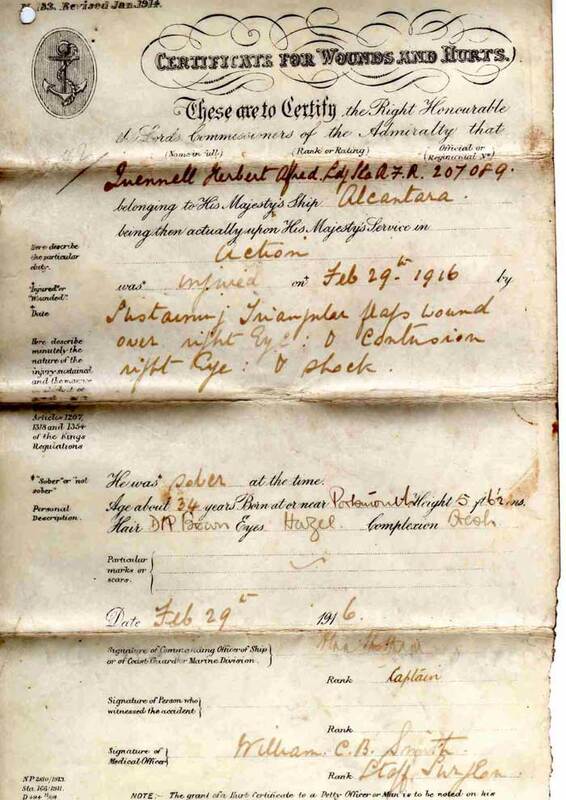 Documents as requested appertaining to A/B Herbert Alfred Quennell, HMS Alcantara 1916. I look forward to seeing them on site. 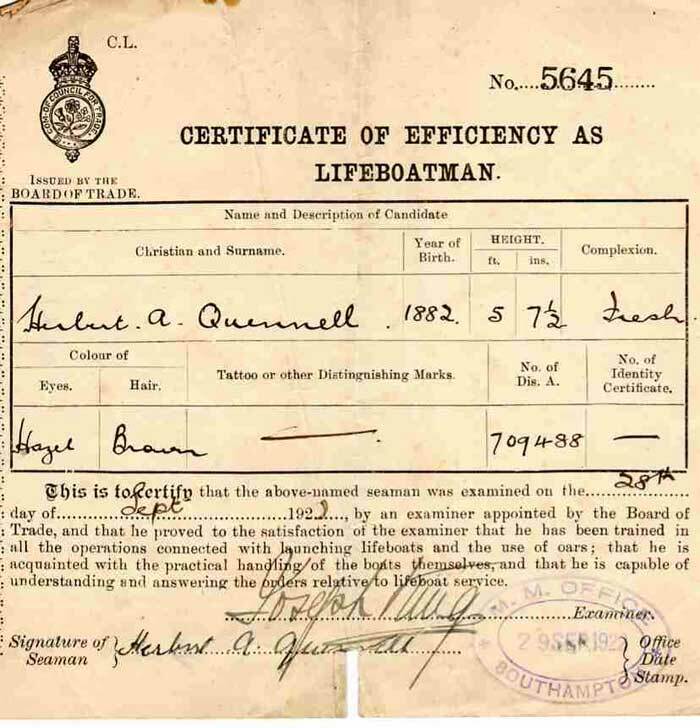 as a matter of interest, the hospital document is on parchment and the lifeboatman certificate is a bonus. There is a recollection within the family that Herbert, in a state of undress,stepped off the Alcantara as she listed,straight into a lifeboat without getting his feet wet. time, but who knows what may be discovered in the future. All the best for Christmas and the New Year. Thank you for that, I have passed your message to Terry and will let you know when he has those fascinating documents up on AHOY. I loved the question on the Wounds and Hurts Certificate about whether Herbert was sober or not at the time. I am most grateful for all your interest and trouble in sending me those copies, I am sure many who visit our site will also enjoy them, a real peek into the past. There were not too many scraps between two enemies at sea in either WW1 or WW2 where both ships sank. May you and your family enjoy the festive season, and have a great 2007. Fascinating stuff indeed, Mac. I particularly like the Certificate For Wounds And Hurts. I wonder if that space was really meant to be used to indicate the injured person's sobriety! I've attached the Roll of Honour for the HMS Alcantara published in The Times 27 March 1916. H.A. Quennell is listed. Many thanks for all you've done to put my wife's grandfather into the pages of history. Please pass on my grateful thanks to Terry for an exellent job done, also Martin for his Roll of Honour contribution. A year ago I wouldn't have given you tuppence for a computer, but being retired I knuckled down and taught myself, and I am overwhelmed by what I have achieved on this subject. I will now have the pleasure of researching the Comus, Andes and Munster, which took part in this ill-fated conflict, from your most excellent web site. We were pleased to help. Keep up your good work on your Computer, and I am sure, like me, you will reap many rewards from people and subjects, as you trawl the wonder of the Internet. If I can ever be of any small assistance please do write. I read with interest the information about my Grandfather, Herbert (Bert) Alfred Quennell. He was awarded a pocket watch from the German Government which I believe in the possession of Mark Colquhoun. He is the Great Grandson of Herbert and Minnie Quennell. I live in Florida USA and so do not have daily contact with my cousins. Thank you for your note, we will add it to our segment about Bert on AHOY. It is amazing how one entry may spark a bit more information from another area of our world. Do you have any idea why the German Government might have awarded him with a pocket watch? Not many actions at sea in either WW1 or WW2 resulted in both ships involved being sunk.